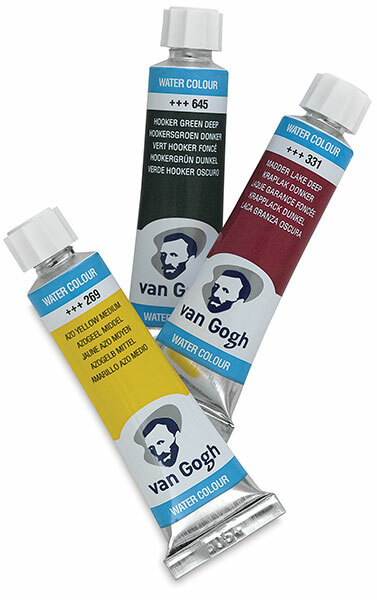 A brand for serious artists of all levels with an eye for quality, Van Gogh Watercolors are intense, lively, and very transparent with high tinting strength. Every brilliant color in the line features the highest degree of lightfastness — decades later your work will display the same color as it did the day you painted it. Due to the purity of the colors, Van Gogh Watercolors are extremely easy to mix and wash to create the subtlest of differences in shade. Van Gogh Watercolors are made in the Netherlands. Each tube contains 10 ml (.34 oz). Set of 10 Tubes — A great introduction to Van Gogh Watercolors, this set features 10 ml (0.34 oz) tubes in 10 basic colors. The carton lid also includes some watercolor painting tips. Set of 12 Tubes — A wonderful array of watercolors plus painting accessories in one convenient case. 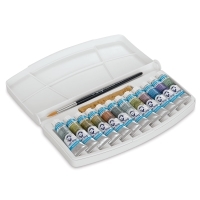 This set includes 12, 10 ml (0.34 oz) tubes of watercolor, a natural sponge, and a pointed round nylon brush (size 6). 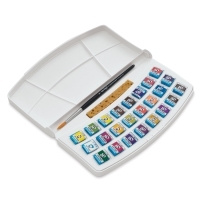 The plastic travel box has a palette lid, perfect for color mixing. Set of 18 Half Pans — Perfect for painting on the go, this sturdy set includes 18 half pans and two 10 ml (0.34 oz) tubes of watercolor, a natural sponge, and a pointed round nylon brush (size 6) all neatly housed in a white plastic palette box. Use the generous palette lid to easily mix colors. Set of 12 Half Pans — Slip this little travel box right in your pocket. This handy, portable set of Van Gogh Watercolors includes 12 half pans and a pointed round synthetic pocket brush (size 6). The refillable box is made of durable plastic. Its palette lid can be taken off, making it easier to clean the mixing wells. 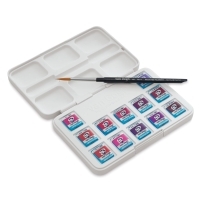 Pinks & Violets Set of 12 — This 12-pan watercolor set is packaged in a plastic pocket box and includes a size 6 round synthetic taklon brush and a mixing tray. 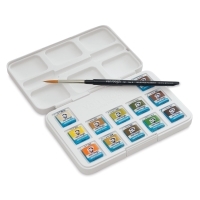 Shades of Nature Set of 12 — This 12-pan watercolor set is packaged in a plastic pocket box and includes a size 6 round synthetic taklon brush and a mixing tray. 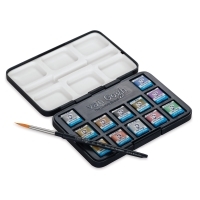 Special Metallic & Interference Set of 12 — This 12-pan watercolor set is packaged in a plastic pocket box and includes a size 6 round synthetic taklon brush and a mixing tray. 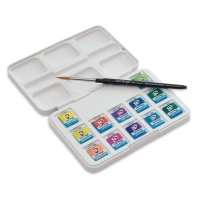 Vibrant Colors Set of 12 — This 12-pan watercolor set is packaged in a plastic pocket box and includes a size 6 round synthetic taklon brush and a mixing tray. Botanical Set of 24 — This 24-pan watercolor set is packaged in a plastic pocket box and includes a size 6 round synthetic taklon brush and a mixing tray. Metal Tin Set of 48 — This 48-pan watercolor set is packaged in a metal tin case and includes a size 6 round synthetic taklon brush. Set of 20 Tubes — This general selection set of watercolors includes 20, 10 ml tubes. Specialty Metallic & Interference Colors Set — This set includes 12, 10 ml tubes packaged in a plastic pocket box and includes a size 6 round synthetic taklon brush and a sponge. Van Gogh Watercolors offer quality and value to the watercolorist in both half pan and tube formats.